[VIDEO] Giant Snake EATS MAN WHOLE! 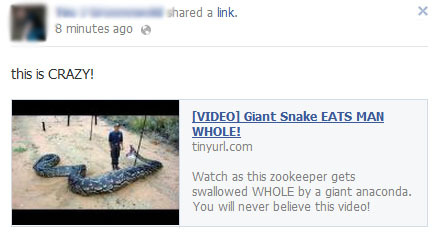 Watch as this zookeeper gets swallowed WHOLE by a giant anaconda. You will never believe this video! If you ‘Click Here to Activate Plugin’ you will be prompted to install a browser extension. We decided to stop here, and we recommend that you do the same. As with third party Facebook applications, you should be careful about the browser extensions that you install. If you are lucky, then you might get a bunch of adware installed to your browser. Rogue browser extensions are known to be malware delivery agents. You are totally at the mercy of the add-on developer! Only install add-ons from trusted, well-known sources!